The low grain of the sound of Dirk de Bruyn’s voice weaves through many of the films he made in the 1990s. Mike Hoolboom characterises this voice as providing an “inner monologue and conscience”, a mode that Dirk had “copped… from the Canadian filmmakers who interminably used their movies as a pretext for chit-chat” (1). But Dirk’s employment of a device favoured by these singer-songwriters of Canadian experimental film (Hoolboom himself and the likes of Philip Hoffmann, Kika Thorne, Steve Reinke et al.) is, as Hoolboom observes “every bit his own”, and as distinctive in the texts it narrates as it is individual in its timbre. Dirk’s voice rarely supplies the relatively cohesive narration that one usually finds in first person cinema. Rather, it combines fragments of phrases, a series of hints in a fluid syntactical, semi-random, found poetic flow. Films like Understanding Science (1994) and A x Canada (1995) often share the voiceover narration with Dirk’s immediate family, but in Rote Movie (1994) he goes solo, placing himself behind the wheel of a car, reciting words reflecting on his feelings of exile, distance and loneliness: “walking through a landscape alone”, “gypsy”, “victim”, in a slow vaguely depressive incantation of unintelligent memories. By Traum a Dream (2002) the unintelligent memories have become distinctly more sinister. Samples of found footage suggesting memory and repression vie chaotically for attention with Dirk’s voice reciting repeated words and phrases, punctuated by splutters and coughs, as though attempting to wrest some meaning. This meaning comes at last with the final sentence dragged out phrase by phrase in the third person: “he began to remember what he didn’t want to remember, what had been taken from when before he knew a secret of before he knew himself”. The voice anchors these films in a personal, subjective realm that avoids direct expression or communication in preference to a combination of syntactic tics and diaristic “notes to self”. This statement of intent is a key to Dirk’s films. These restless, hybrid home-made animations typically cut together a pixellation driven, fast-forward clash of graphical images, hand-drawn, direct-to-film text, erasure and manipulation of found footage; ideas are just grasped before successive fresh images and repetitions move through another set of visual experiments, leaving the signature movement trace of a gesture. Rote Movie is made from images of road signs, cars and billboards, the passing landscape rendered as elegantly simple rotoscope drawings, reprinted and texturally manipulated filmic images, and the inevitable repetition of countdown leader. In subsequent films Dirk has been refining the more associative and illustrative relationships between image and sound of Rote Movie, into more abstracted forms, equally personal and subjective but more dynamically reflexive. One ingredient in these films is found footage; variously operating as a texture, a signifier of nostalgia and memory, an index of the medium (academy leader, etc.) and an occasional oblique commentary. Usually this sits within the repertoire of effects and manipulations, but the recent film H2 (2005) is an enigmatic exception. Cut down to 16mm from a 35mm trailer for the movie Shaft, the slowed down voice, gunshot explosions and lsaac Hayes’ iconic music become barely recognisable and monstrous. The arbitrary framing provides glimpses of the edges of faces, fleeting urban scenes, partial text, all rendered in cyan negative in a kind of psycho-dramatic abstraction, all the more unsettling than Gordon Parks’s originating gangster populated dystopia. It is a reminder of how, by simply repositioning the frame, extant material can be transformed. 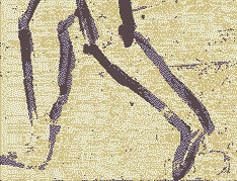 In the 2nd Hand Cinema films (2005) there is a more deliberated manipulation; clear snatches of the retro signifying veneer of found footage heavily worked over with hand colouring, dyes, drawing, shapes, semi-random text, images of faces merge with more and faster movement, stuttering voices, scratching, the sound of counting, like so much cognitive excess. Analog Stress (2004) combines reworked and reanimated found industrial and discarded personal footage into something like an audio-visual/filmic version of a scraped back advertising billboard; multiple layers of tattered posters ripped and covered in spray paint, sinking into decay; a chaotic concrete soundtrack reconstructed from scratches, pen marks, Letraset strips and found music and phrases. It is a restless and arresting abstract description of excess and distress. These films are the stuff of the superficial sublime; palimpsests piling surface upon surface, scraping back here and layering there, a process that obscures as much as it reveals, but is purposefully obscure in its superficial dimension, not a direct obfuscation but a reproduction of obfuscatory states. And now back to where I started, the grain of Dirk’s voice reverberates with Australian-ness as the laconic burr locates the accent. Critical references to Australia are ironically peppered throughout these films. 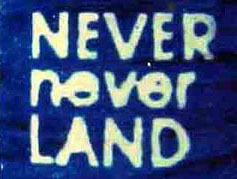 The references to “never-never land” in 2nd Hand Cinema, the sampling of “the only way we can give an Australian picture international appeal is to make it Australian” in Analog Stress, speak to the irony of Australian cultural self-perception, the expedience of side-stepping the question of exactly what is “Australian” while continuing to invoke the mantra of Australianism. UnAustralian (1997) contains one of Dirk’s more direct comments on this condition, as archival film of Dutch migrants to Australia is juxtaposed with The Seekers song, The Island of Dreams. UnAustralian was a multi-media performance collaboration between Dirk, musician Nicole Skeltys and myself in which we explored the shifting signifiers of Australian-ness and its cultural and political insecurities and paranoia. UnAustralian was conceived in the heady wake of the Melbourne culture wars that followed Creative Nation (3). Australian Prime Minister Paul Keating’s 1994 reforming cultural agenda sought to ride the then new digital media along the “Information Superhighway”. On the face of it Creative Nation‘s drive was an idealistic call to push Australia into the next century, conflating political and capitalist economic expedience with communications media which would now determine models for media art. As a wide ranging, interventionist, deterministic and top-heavy cultural agenda many government agencies took this as a cue for their own visions of permanent cultural revolution. In its idealistic embrace of the new over everything else, some of the works manifested under this regime resembled digital new age metaphysics (such as promulgated by the likes of Nicholas Negroponte(4) and Michael Heim (5)), embracing escapist dreams of networked consciousness, distributed beings, simultaneously leaving the twentieth century and the fleshware of the human form. In the mid-1990 media art front runners frequently produced works underpinned by fantastically synthetic, voguish notions of disembodied consciousness and artificial life; artists obsessed with escaping the body, creating new life forms or virtual utopias (examples might include those often favourites of the funding bodies like John McCormack, Martine Corompt and Patricia Piccinini). Furthermore digital media art was usually expected to be “interactive”, in the sense of demanding the viewer’s active, immersive determining engagement with the works which in some cases became like little virtual worlds. There was the illusion of self-determining life extensive of the human, a kind of artificial after life in which to escape from the grime of everyday material reality from the tiresome burden of history, and to sublimate those painful collective memories. It wasn’t so much that the artists were burying their heads in the sand, more that they were flying at such altitude as to no longer know where the ground was. Australian media arts seemed to be driven by an aggressively “new world” positivist idealism, unwilling or unable to broach ideas of failure, decay, self-doubt, a neo-conservative evangelical agenda. The new world would be culturally determined and the individual socially constructed, while conveniently forgetting the reality of life in the physical body in the material world, the inevitability of age, decay and death, the immediate effects of unpredictable weather, earthquakes and tsunami as material life goes on and confronts the very real physical results of conflicting idealisms in Manhattan, Kabul, Bali, Baghdad, London… Life is not lived in the world of the ideal universal but in the here and now of local material conditions (6). The reason for these speculations about the state of media arts in Australia is not to suggest there has been a wholesale conversion to neo-conservative new media idealism, or that Creative Nation has been a fait accompli, or that there are no longer artists making work that is non-idealistic, critical and dealing with the tangible. My point is to suggest that there is a direct link between cultural production and prevailing ideologies, to argue for an alternative to idealism and the critical efficacy of a materialist approach. This locates the relevance of Dirk’s work within a cultural context that might argue that a materialist film practice is anachronistic – an engagement with the material world is fundamental to existence. A projected new media future and other idealisms are not sustainable in the long term. Digital media is itself just as subject to material decay as analogue forms, a fact that anyone who is now experiencing the reality of the lack of digital media longevity with corrupted data on CD-ROM or DVD and crashed servers will testify to: entropy is the revenge of the material. In recent years there has been an investigation of the raw “material” properties of digital media, such as in the “glitch” work of the likes of reMI and Billy Roisz from Austria and Bas van Koolwijk from Holland. In Australia a more materially forensic approach to the digital movement image is being investigated by Daniel Crooks. Within experimental digital practice there is a return to a search for the material, to make visible the essences of data disturbance and to visualize structure and process. In this “post-digital” context, Dirk’s concern with materiality and physicality is not simply a political act of defiance against the lingering ghosts of digital idealism. Experimental Film is a direct working theory in practice (7) and in the course of its history practitioners have worked the genre to various ends and effects. For example: in the deliberate strategic distanciation or alienation of the viewer (Peter Gidal), as poetical expressionistic abstraction (Stan Brakhage), and through the propelling of the viewer into direct physical response through extremes of effect (Paul Sharits). Similarly, Dirk’s practice is urgent and key right in its relationship to contemporary media culture. It locates itself in the stuff of the everyday and the layers of personal experience and history; it acts as an exorcising desublimation with the shifting associations of the present. It is dialectically opposite to a preemptive or idealistic imagining of the future. Its self-evident physicality is both trace and symbol of tangibility. Analog specifies that emphasis, Stress, like Traum a Dream, suggests something psychological enmeshed in its very fabric. These films are direct theory in the processes of the material working through the symptoms of damage, the production of living signs, neither representational, metaphorical or symbolic. In their stress and distress they materialise a relationship between the restless abstracted flow of sound and image trace and more psychic disturbances. They concretise the possibility of a direct connection between lived experience, memory, the physical processes of making and the experience of viewing. There is an inscription of conditions that are conflicting and abstracted. Viewing can become a restless, nervy experience producing cognitive conditions that share the symptoms of some of this dis-ease. Mike Hoolboom, “By Hoolboom: Notes on Two Movies by Dirk De Bruyn”, Synoptique March 2005. Dirk de Bruyn, Understanding Science program notes, Scratch Film Festival, UWA, Perth, 1997. For this and more writings and information about Dirk de Bruyn’s film work see Dirk de Bruyn, Melbourne Independent Filmmakers. Creative Nation: Commonwealth Cultural Policy, October 1994. Nicholas Negroponte, Being Digital, Coronet Books, London, 1996. Michael Heim, The Metaphysics of Virtual Reality, Oxford University Press, Oxford, 1993. For a sustained argument about the distinction between old and new world ideologies and idealism versus materialism in culture and global politics see Terry Eagleton, After Theory, Penguin, London, 2003. See Edward S. Small, Direct Theory, Experimental Film/Video as Major Genre, Southern Illinois University Press, Carbondale, 1994.